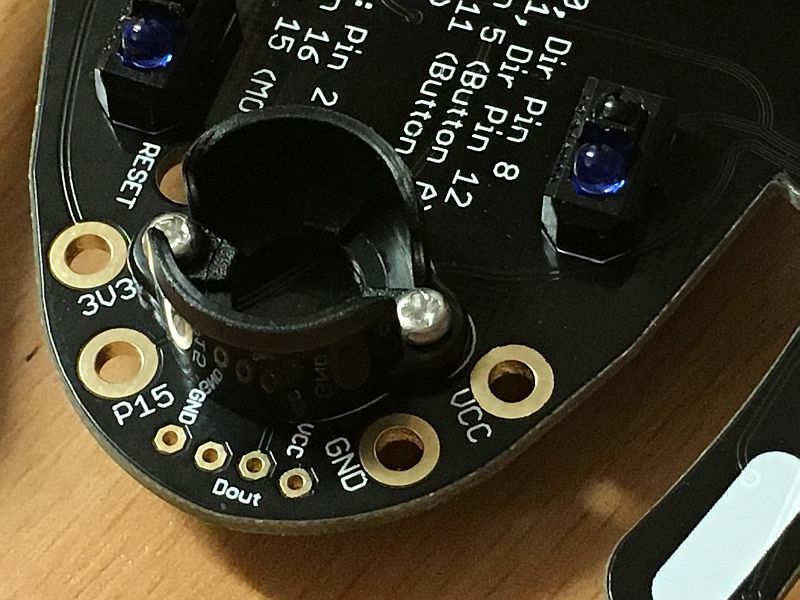 Warning: On versions before v1.2, the line follower sensors share the same pins as the buttons. 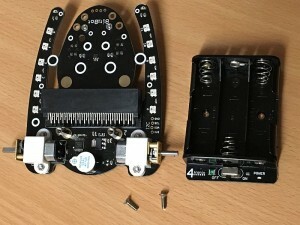 Depending what language you are using, when the Micro:Bit is started or reset it will check the 2 buttons and start pairing if they are both pressed. 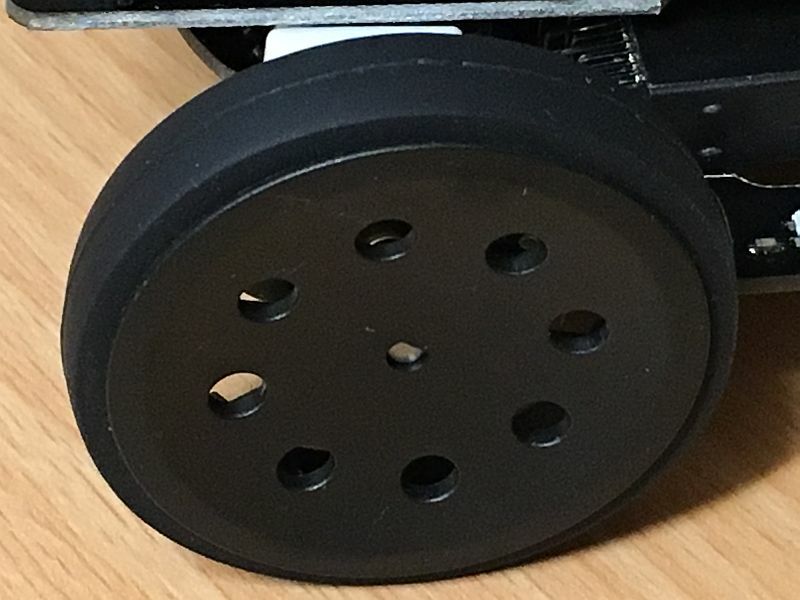 With the Bit:Bot, this translates to both line follower sensors getting reflections. You can stop it happening by lifting it off the surface before switching on. 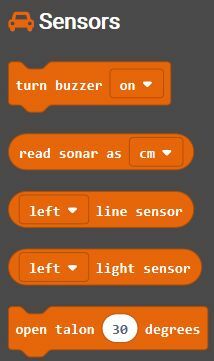 On v1.2 the line sensors are disabled for 2 seconds after power on so that the MicroBit doesn’t detect the pairing situation. 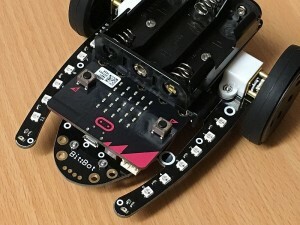 In addition there is a small switch that allows you to disable the line follower sensors completely, allowing the use of the MicroBit buttons. At this point you should have 4 screws left. Either 4 x 8mm countersink, or 2 x 6mm panhead and 2 x 8mm countersink. If you have the 6mm panhead screws, use these to fit the 12mm brass pillars to the Bit:Bot main PCB. Always use 8mm countersink screws to fit the battery holder to the brass pillars. Use the 8mm countersink screws to fit the battery holder to the brass pillars. 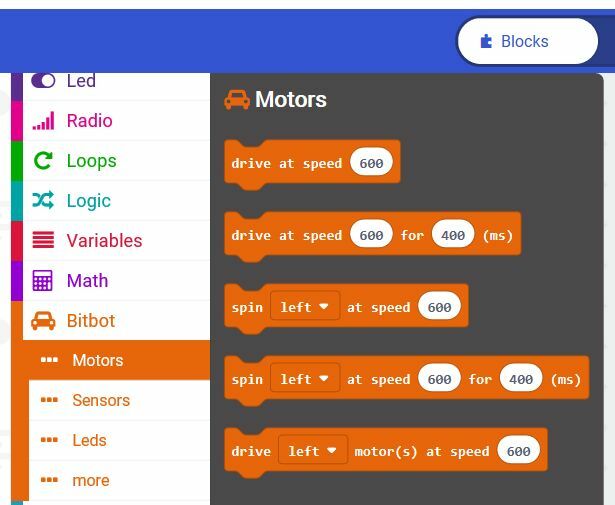 For Makecode block programming, you can use the official BitBot extension. Go to the Advanced tab (or press the cog icon) and select Extensions. 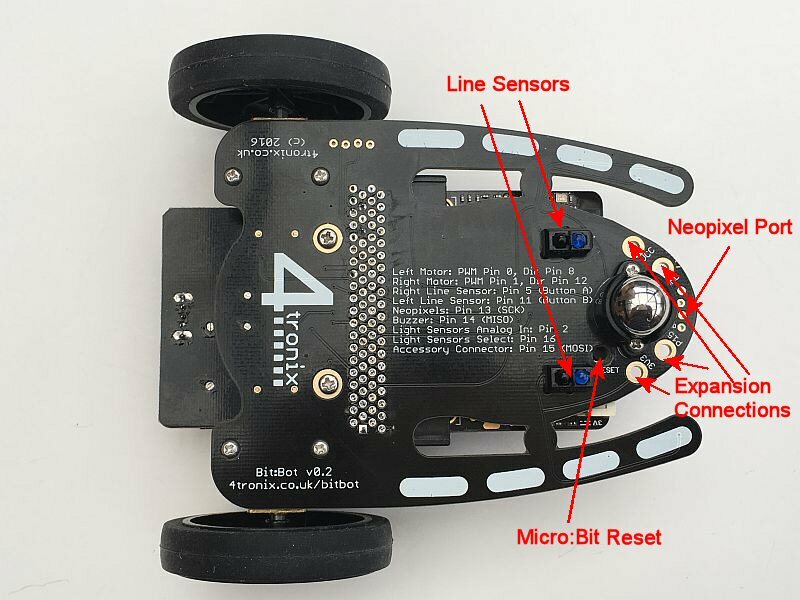 Then search for BitBot and select the official package. This will give you a BitBot tab in the toolbar with 4 sub-categories for the Motors, Sensors, LEDs and advanced (…more). For text-based programming there is micro-python, and I prefer to use this offline using the Mu editor. 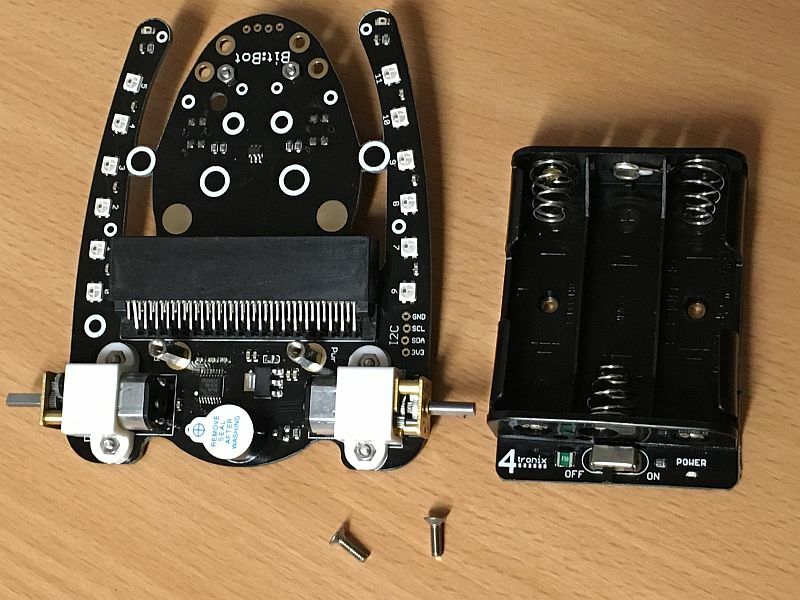 It provides a very neat and easy way of interfacing to the micro:bit without all the fuss of dragging and dropping. NOTE: At the time of writing (December 2016), there are problems with Mu when using PWM with neopixels and other things, so it best to use the online micropython editor for now. The following examples use both of these languages to show code fragments. Note on examples: We want to show people how the various features can be used. We don’t want to do the coding for you – that is the learning experience you should be taking away from using it. In the following examples, we will give you the tools to use all the features of Bit:Bot but it is up to you to combine them together in your code to make it do something useful. We do give a complete example of line-following – but it is a very basic algorithm and will get confused at T-junctions and crossings; and it doesn’t use the neopixels. Download Python examples at the bottom of this page. 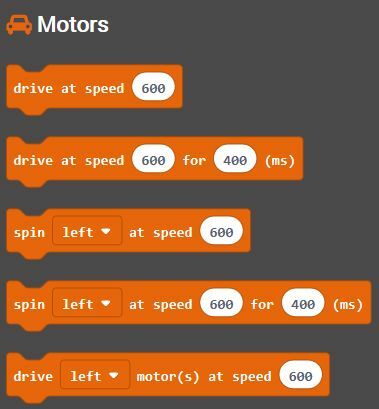 The first one “drive at speed 600” simply turns both motors at the speed selected between 1023 and -1023. 1023 is full speed forwards and -1023 is full speed backwards. Setting the speed to 0 will stop both motors. The second one will do the same, but then stop both motors after the time selected. The next two “spin <left> at speed 600” will spin the BitBot on the spot by turning one wheel at the selected speed forwards and the other at the selected speed backwards. The final block allows you to control the individual motors. Either the left motor or the right motor (or both). This is so that you can make a long sweeping turn instead of spinning on the spot, by making one motor go slower than the other. A great feature of the Bit:Bot is the set of neopixel LEDs, 6 down each arm. However, we have made it so that the default is “automatic updates”, so any changes made to the LED values will automatically result in the LEDs changing. This is a slower way to do things, but much easier to understand. If you want the normal, manual, update method then this can be selected from the “…more” category. 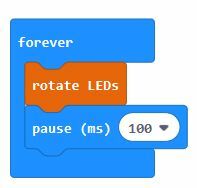 And by using the forever block you can get the LEDs to animate using “rotate LEDs” and a pause to slow them down. In this program it reads the distance in centimetres. If it is nearer than 20cm then it reverses and turns, otherwise it carries straight on. The idea of these sensors is that you create a black, non-reflective, line on an otherwise reflective surface. 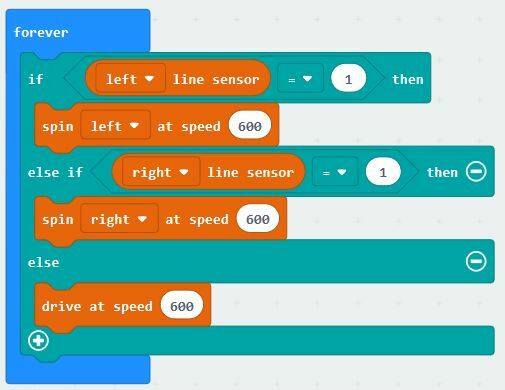 You can then program the Bit:Bot to follow the line. For text-based programming there is micro-python, and I prefer to use this offline using the Mu editor. 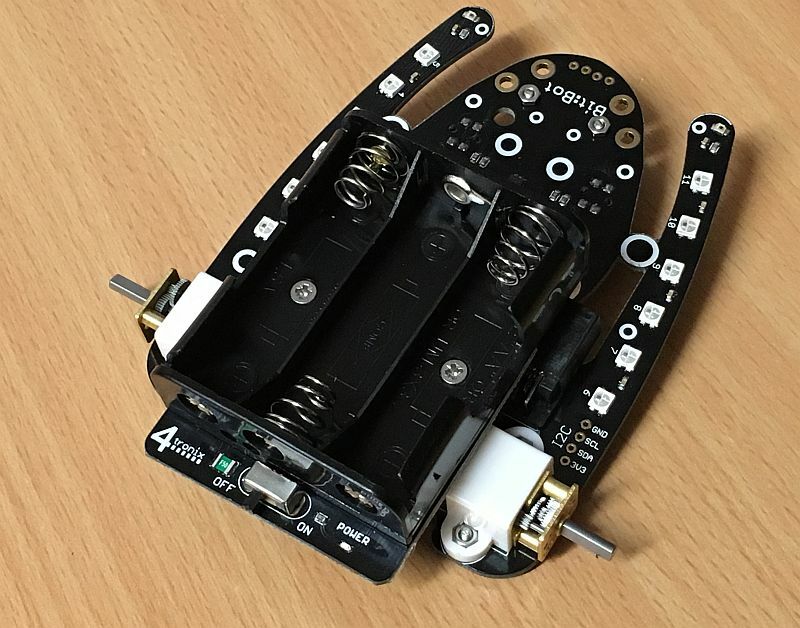 It provides a very neat and easy way of interfacing to the micro:bit without all the fuss of dragging and dropping. If we want to change the speed of a motor, so that it is not going at full speed all the time, we need to use PWM (Pulse Width Modulation). This is means of changing the amount of power given to the motor by switching it on and off very fast. The percentage value of PWM determines the amount of each cycle that the output is ON. So a percentage of 100% is the same as being on all the time and thus the same as the examples above. A percentage of 50% would mean that the motor is only energised half the time, so it will go much slower. Note that the actual speed of the motor is not the same as the percentage of PWM – the motor won’t turn at all if the PWM value is too low and you will also get some stuttering at certain values. 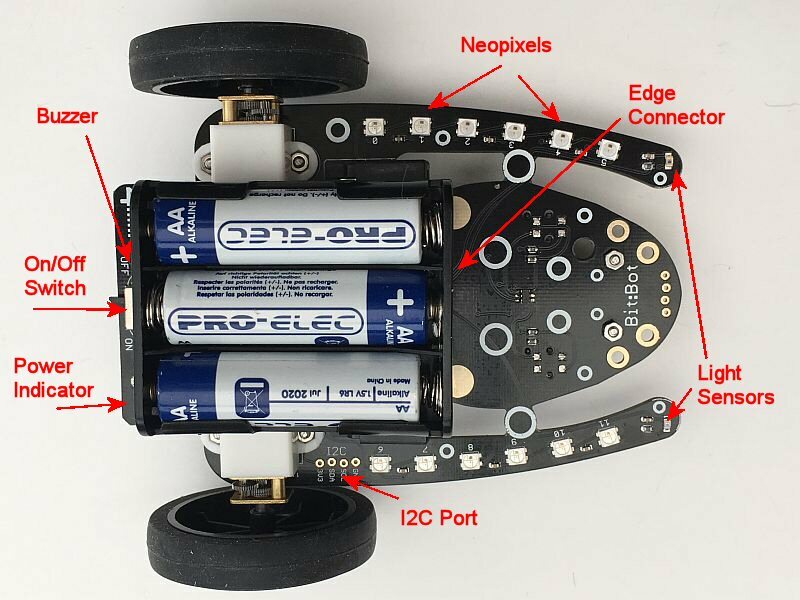 Nevertheless, being able to change the speed makes for a much better robot. For example, you can make a line follower that smoothly follows the line, rather than the normal shaking left and right. These smart RGB pixels are able to display any of 16 million colours by selecting a value of 0 to 255 for each of the Red, Green and Blue LEDs on each chip. The whole thing is controlled by a single pin on the BBC micro:bit (pin 13 for Bit:Bot). 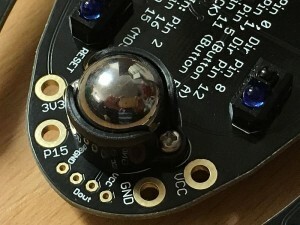 It is simple to use the included neopixel libraries to control each pixel individually. 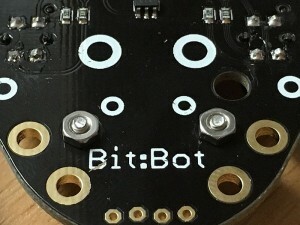 The pixels are labelled on the Bit:Bot. From 0 to 5 on the left arm and from 6 to 11 on the right arm. 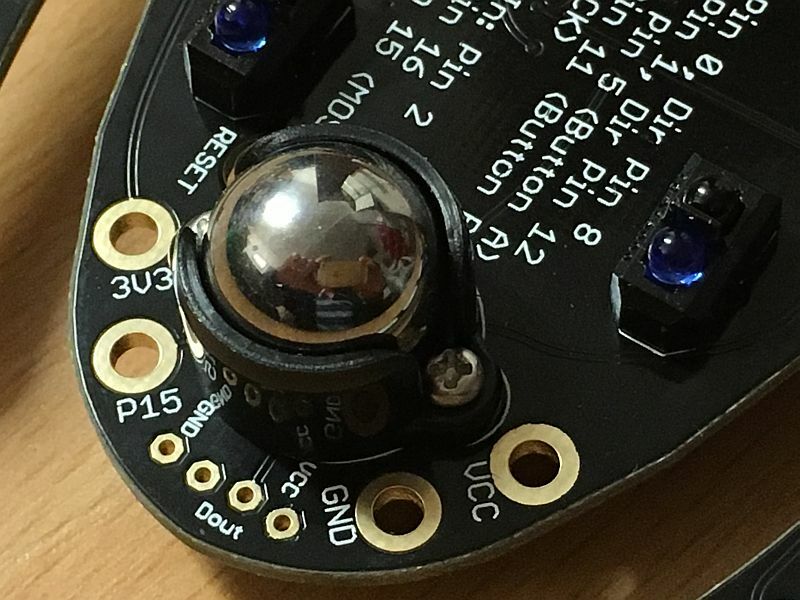 If you connect any more neopixels into the extension port, then the new ones will start at 12. The third line sets the pixel we have selected (number 2 in this case) to the colour which is set by three values in the brackets, each value can be from 0 to 255 and covers Red, Green and Blue. In our example we have set Red and Blue to 40. 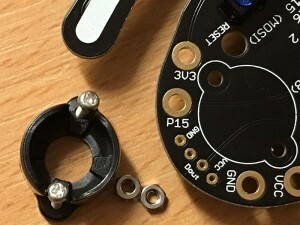 These are digital inputs and connected to Pin 11 (left) and Pin 5 (right). 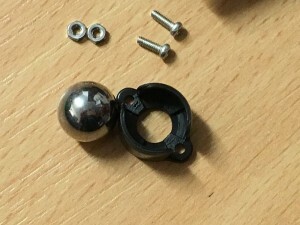 These are the same pins as used by the buttons, so pressing a button will have the same effect as detecting a black line. 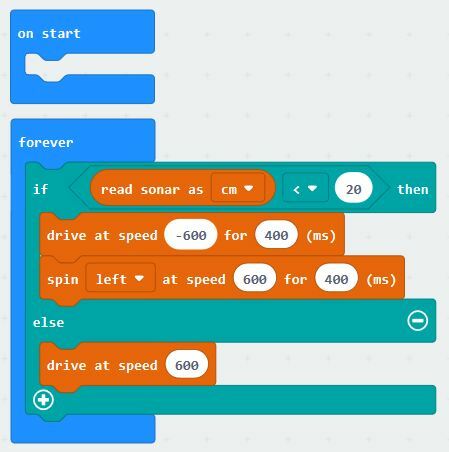 This may have unexpected side-effects – as switching the micro:bit on when both buttons are pressed can cause it to enter Bluetooth pairing mode (depending what software is installed). These are analog sensors and will give a value of 0 to 1023, where 0 is fully dark and 1023 is maximum brightness. 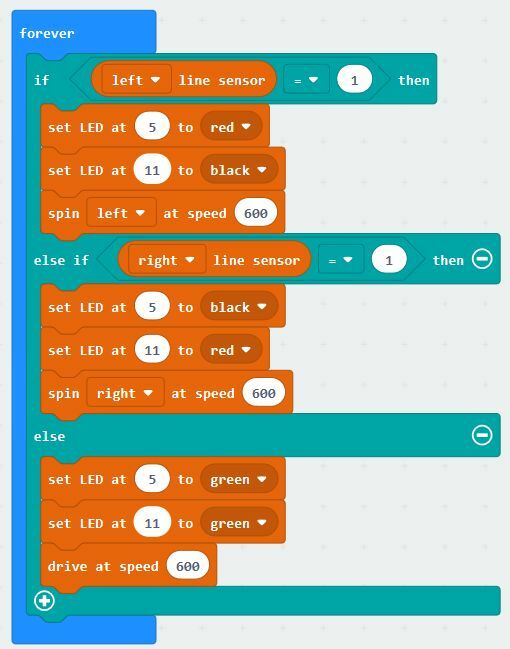 As there are only 3 analog pins available on the micro:bit (without affecting the LED displays) and we are using 2 of them to control the motors, we only have one left (Pin 2) to read the analog values from 2 line sensors. How can we do this? Well, the Bit:Bot has an analog switch that uses a digital output signal (pin 16) to determine whether the analog input we are reading is for the left sensor or the right sensor. Therefore, to read the light sensors we need to set the selection output pin first, then read the analog data. The buzzer is a very simply device that outputs a 2.4kHz sound when it is set to ON. 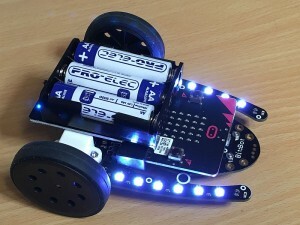 It is NOT controlled by the tone signal that can be output by the micro:bit on Pin 0 so you don’t need to install any libraries to operate it. It is connected to Pin14. 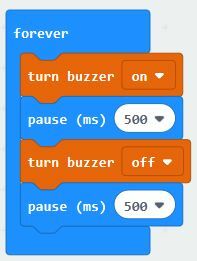 Setting this to ON (1) will activate the buzzer and setting to OFF (0) will deactivate it.